This book traces the process by which national elections became international events or, more precisely, what the effects of this process are on state sovereignty. Contrary to the conventional wisdom in International Relations - to judge by the neglect of this phenomenon in the literature - this book argues that the study of IEM does not belong only in the field of comparative politics. As a system-wide phenomenon, IEM should not be restricted to the study of purely domestic politics or of foreign policy. This book contends that sovereignty has been partially transformed by the recent emergence of IEM. Furthermore, the author locates the origins of this change in the Americas, claiming that the western hemisphere's normative structure - what Santa-Cruz calls the Western Hemisphere Idea (WHI) - was particularly conducive to this new understanding of state sovereignty. This is the first work to engage the issue of IEM in a comprehensive manner from a theoretical perspective. 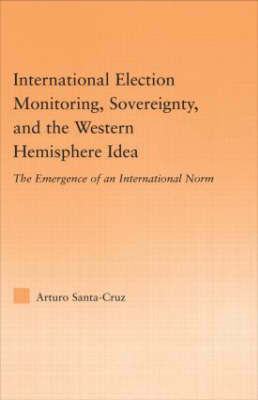 International Election Monitoring, Sovereignty, and the Western Hemisphere covers a broad and relevant scholarly literature, and the cases comparisons widen the book's appeal, since they illustrate a useful range of experience.